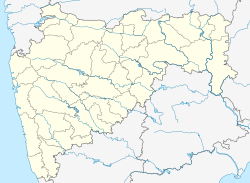 Dhule Airport (IATA: DHL, ICAO: VA53) is located at Gondur area in Dhule, Maharashtra, India. This airstrip was constructed in 1974 by the Public Works Department and was transferred to the Maharashtra Airport Development Company (MADC) after its formation in 2002. The Bombay Flying Club leased the airstrip from the MADC and shifted its training operations here in 2009 to avoid the congested air-space of Mumbai. ^ "Airstrips in Maharashtra". Maharashtra Public Works Department. Retrieved 1 April 2012. ^ "MADC Projects". MADC. Archived from the original on 26 February 2012. Retrieved 1 April 2012. ^ "Busy city skies push flying club to Dhule". The Times of India. 24 May 2010. Retrieved 2 March 2012. This page was last edited on 7 March 2019, at 04:18 (UTC).